Security expert Eldon Sprickerhoff of eSentire whispers to me from the shadows that Toronto will be the scene for a major conference on security in November. SecTor has a stunning lineup of speakers from the cream of the security community – representing hackers, law enforcement, vendors, organizations and corporations – looks like the hats will be a mixture of white, black and all shades of gray. Ajax Experience 2007 East is done. Another great show with really great content and really engaged attendees. The final day started out with a keynote from Aza Raskin of Humanized fame, who among other things highlighted the Endless Pageless pattern that fellow Canadian Pete Forde talked about in an article last year. I gave my Ajax Transport Layers talk to a modest yet receptive audience. Doug Crockford‘s JSON talk was up to his usual standard. In the afternoon there was an animated panel discussion on Ajax Futures, with John Resig from Mozilla, Andre Charland of Nitobi, Douglas Crockford and Aza Raskin. Kris Zyp followed with a great talk on Advanced JSON. Some of the JSON-RPC stuff he talked about was very similar in concept to the Jester stuff covered by Pete and Eric yesterday. I have to say that Kris strikes me as the one guy who deserves the “smartest-guy-of-the-conference” award. 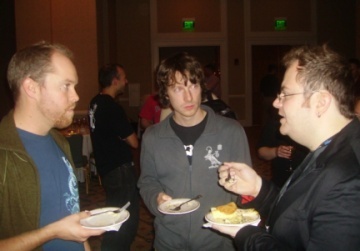 Here is a pic of the Ajax Experience Canadian speaker contingent – left to right: Andre Charland and Dave Johnson of Nitobi, and Pete Forde of Unspace. 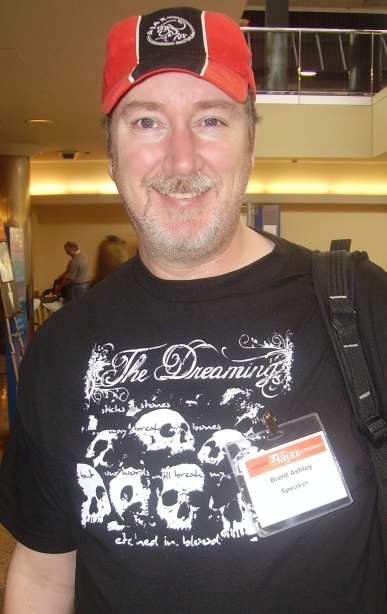 And here’s a picture of yours truly, with my new t-shirt from The Dreaming. No relation, honest. Stuart Halloway speaks again, and it’s entertaining as usual. Get the presentation slides on his blog. Stuart’s Refactotum presentation encourages the audience to take the leap to make a contribution to an open source project. See Ryan’s presentation slides in PDF form. A great way to make fewer requests is with image concatenation, whereby a bunch of images are bundled into a single larger image, and lay out the sub-images via css viewports into the large image. usually broken by firewall configs – test from outside your environment. HTTP spec allows two concurrent browser connections to each server. Using multiple hostnames per server, you can get two connections per hostname and increase the number of parallel connections allowed. There’s a bit more as you will see when you look at the presentation PDF, and he gives some demos of code profiling in action – I imagine you can tell already that Ryan is extremely knowledgeable about and experienced with browser application performance analysis. Stuart Halloway is one of the most engaging speakers you are ever to likely to see. He knows his topics well and he presents in a very entertaining and often tangential style. I won’t bother to comment on the Advanced Prototype part of his talk – you can find prototype discussed in many places. I’ll try instead to follow some of the tangents. I look forward to his “Refactotum” talk tomorrow, which will be about how to contribute to an open-source project. Chris Schalk is a Developer Advocate at Google. His talk is called Beyond XHR: Taking Ajax Offline With Google Gears. Google Gears is a browser plugin that provides offline storage and other supporting functionality. It is supported in most popular browsers. With Gears you can completely decouple communication from UI actions. The communication happens periodically when connectivity is available. Chris’s presentation is itself an offline app created with Gears (no link, I’m afraid although a variant of it comes with the gears download). It works equally well online or offline. Chris encourages us to visit http://code.google.com/ to discover the cool things google is working on and learn how to use them. I’m going to subscribe to the Google Code Blog RSS feed right now. If you have Gears loaded up and want to try an example app, have a look at the blog.gears sample app. You can download the ECMAScript 4 final draft to see the details. My initial take is that while there are lots of neat things, many seem to me to be new ways to make your code more complex and confusing. I think Douglas Crockford, who’s sitting beside me, feels similarly. I’m in Boston this week for the Ajax Experience conference. As usual, it’s got a stunning array of speakers and keynotes. I’ll be blogging as I go, so stay tuned. You are currently browsing the brentashley weblog archives for October, 2007.